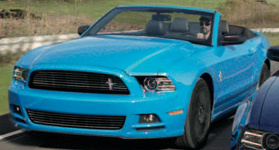 The 2014 Mustang Club of America Edition continues to be an options package for the V6 Mustang. It includes a dark stainless-painted billet-style grille with offset pony emblem, lower fascia-mounted fog lamps, unique bodyside tape stripes, 18" Sterling Gray Metallic-painted aluminum wheels with P235/50R18 W-rated tires, premium carpeted floor mats with embroidered Mustang Club of America logo, automatic headlamps, and rear decklid spoiler. This is a Mustang Club of America limited edition 2014 Mustang coupe. It's owned by Kevin Briggs from Little Rock, Arkansas. This is our featured Attitude Of The Week for the week starting November 2, 2014. It has a V6 engine and a manual transmission. Kevin tells us, "This Mustang Club of America Edition was purchased new, two weeks ago today. It was located in Kentucky and brought to Jacksonville, Arkansas after I agreed to purchase it. I had not actually seen the car, I knew the exterior color and I was aware that it was a V6, 6-speed manual. When I saw it for the first time, I actually had no idea what an MCA Edition Mustang was and was further surprised how it was equipped. I was not expecting leather interior, NAV screen, SAT radio, power seats, driver and passenger, universal garage door opener, heated seats, dual climate control, customized lighting, and the Mustang projected on the ground (from the side mirrors). I believe I will hold on to this one." Deep Impact Blue 2014 Mustang Club of America edition Mustang convertible owned by Brian and Sondra Selle from Hannibal, Missouri. This is our featured Attitude Of The Week for the week starting May 10, 2015. Brian tells us, "We got it last year and have been touring a lot of back roads in Missouri enjoying the top down and wind in the hair feeling. The Deep Impact Blue is a beautiful color but hard to keep clean. It handles great and the 305 HP V6 is a lot of fun to drive. It is always a hit when touring the wine country roads. Life is good!"